In the book of Wedhapradangga (chronicle of Gotek), volume II, compiled by Raden Ngabehi Pradjapangrawit, it is stated that gendhing ‘Budheng-Budheng’ was composed during the reign of Paku Buwono IV (1788-1820) by Kanjeng Sasradiningrat. The significance of the title is rather unclear. The word ‘budheng’ in the dictionaries is translated as: ‘dull’, ‘dull-witted’ (but also ‘black monkey’). With regard to the gendhing, I recall a story I heard from Bapak Mloyowidodo: the Author of the gendhing is supposed to be inspired by a Dutch woman who is not particularly beautiful but has special attractions coming from unusual features. Such features are hinted at in the andhegan text, which opens with a likely reference to the husband of the lady. 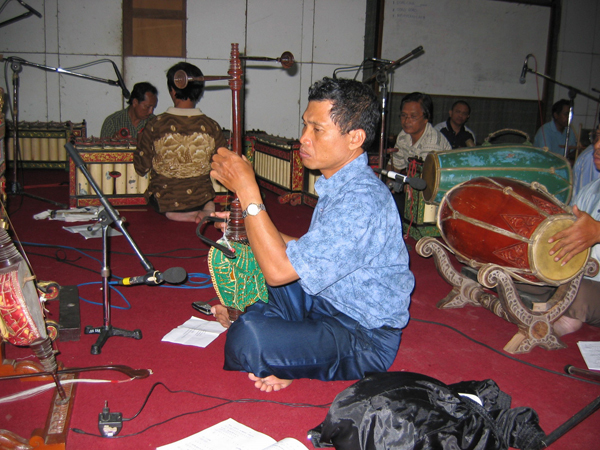 In a classical klenengan performance, gendhing ‘Budheng-Budheng’ is usually played during the daytime, using kendhang ciblon irama wilet. This gendhing has a special sindhenan part known as ‘sindhenan arum-arum’. According to Pradjapangrawit, the often repeated words ‘arum arum’ reflect and emphasize the mood of the gendhing, which when performed has a fragrant (arum) feel. The sindhenan for classical gendhings, from the merong to the inggah, are normally sung by a single pesindhen using a text of wangsalan with a free rhythmic style (with the exception of gendhings Bedhayan and Srimpen). Other texts are rarely used (except in the case of gendhings which are specially composed with a gerongan text of Kinanthi or Asmarandana metres). The melody of sindhenan wangsalan in general follows the melody of the rebab, based on the seleh notes of the gendhing. However, in the case of gendhing Bedhayan and Srimpen, the seleh of the vocal melody does not always follow the melodic line of the rebab or the particular pitch (high or low register) of the seleh notes in the gendhing. Sometimes, the seleh note for the balungan may be in the lower register while the sindhenan uses the high register, or vice-versa. With reference to the above guidelines that rule the general treatment of vocal gendhings – and following a suggestion by the producer of this album – I attempted to compose a sindhenan part for gendhing ‘Budheng-Budheng’ using three pesindhen who would each sing a different sindhenan melody. At times, the pesindhen sing a different melody at the beginning of a phrase but end on the same seleh note, while on other occasions the melody is different and the seleh note is also different. The working out of the musical solutions was based on my own personal experience as a rebab player, in which I always attempt to find new, alternative ways of treating a gendhing (garap), so as to avoid repetitive performances. The texts used for this version of ‘Budheng-Budheng’ are as follows. Buka celuk – taken from the final part of an andhegan text, performed by one pesindhen which is later joined by the other two at the end of the buka. First merong – two pesindhen sing in a metrical rhythm an andhegan text (‘Sarpa kresna...’) while the third pesindhen sings another andhegan text (‘Dhuh Kusuma...’). 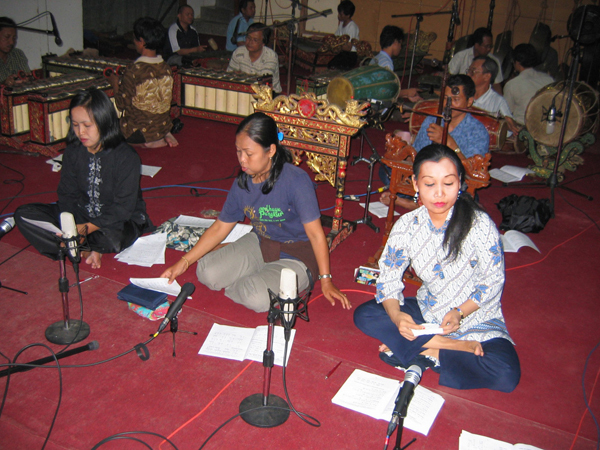 Second merong – all three pesindhen sing a wangsalan and isen-isen text with different sindhenan melodies. Inggah – the first gongan uses the text of the macapat Mijil, with a unison gerong part for the pesindhen and wiraswara (male chorus). The second gongan uses kendhang setunggal kosek alus irama wilet, introducing a calm mood, and the sindhenan part uses a wangsalan text. The sindhenan andhegan uses the text ‘Weruh maneh...’, which is the regular andhegan used in the classic version of the gendhing. Ladrang – the form of the ladrang used is a condensed version of the inggah form. In irama wilet, the gerongan sing a salisir text (‘Punapata mirah...’) taken from the beginning of the chronicle of Bharatayuda (around XIII century), dealing with the death of Prabu Salyo. The next ladrang is performed in ‘semarangan’ style, with a gerongan which I composed myself both as text and music. The second andhegan uses the text ‘Dhuh sang mangka...’ and the classic andhegan melody is developed in a palaran structure. The aim of this revision of a well-known classical gendhing was to add variation and character along the lines of the traditional piece and without changing its aesthetic values. The additions were meant to enhance, by gradual building up, the ‘preness’ (coquettish) character throughout the piece, also with the use of three instead of one pesindhen.